Shopping small – Baby Corn Soaps | Living life in the carpool lane..
Disclaimer: The item featured in this ‘Shopping small’ post is purchased by me. I am not sponsored by the store featured. My daughter’s current obsession is Pokemon. More on that in a future blog post. Buzzfeed featured an article on awesome Pokemon gifts. M and I loved browsing through all the different gift items. Click here to view the article. We came across a Pokeball bathbomb and M was so excited. She loves bathbombs, she loves pokemon, it combined two of her loves. So I obviously placed an order. The shop is Baby Corn Soaps. Clicking the link will take you directly to their Etsy shop. They specialize in various soaps and bath/beauty products. 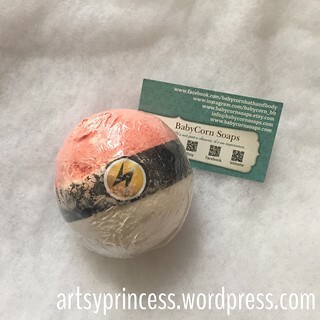 We ordered one of the Pokemon bath bombs, click here for the direct link to the item. When ordering, you have to choose what type of Pokeball you would like. Each type of Pokeball refers to the various types of Pokemon. We chose ‘Electric’ because M loves Pikachu. There was a 1-2 week processing time before the item was shipped to me because the products are made to order. This is what the product looked like once it arrived. It was very well packaged and survived the trip from their shop to our house. 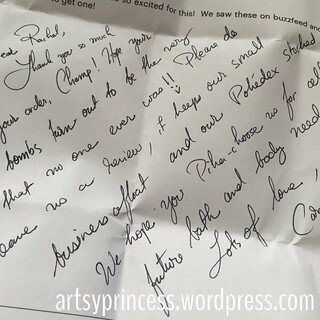 I absolutely loved the hand written note she wrote on the packing slip. It made the purchase so much more personal and friendly. I had a little laugh at all the little Pokemon references she used in the note too. This was very awesome on their part. I had told M that she couldn’t use the bath bomb until I took pictures for the blog. Once I took the photos, she immediately wanted to use it for that night’s bath. When I unwrapped the pokeball from it’s plastic packaging, the other layer crumbled off a bit. It didn’t matter to me because I opened it above the bathwater so I didn’t waste any of it. 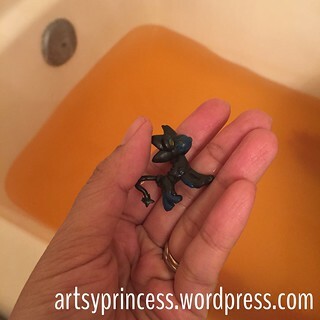 Once in water, it fizzled nicely and turned the water a nice orange/red color. It’s smelled very good too. Once it completely dissolved, we found the little Pokemon inside. That was the most fun part about it all! 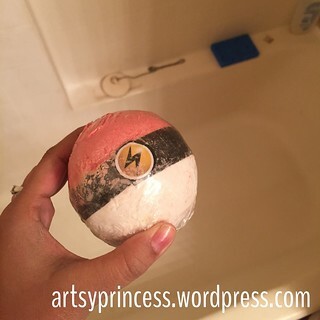 It was so exciting to see what sort of Pokemon surprise was inside the bathbomb. Honestly, we have no idea what Pokemon that is. However, M was just so delighted to find that Pokemon at the end of the bathbomb, she didn’t care that she didn’t know what it was. We have a book of all the different Pokemon, so once we have some time, we’ll look it up. Purchasing from this Etsy shop was quick, easy and efficient. We are planning on purchasing more Pokeball bathbombs again. If there are any other small/handmade shops you’d like me to check out, please leave a comment below. If I feel like it’s a good fit for myself and this blog, I’d gladly purchase an item and leave a review.